Last night in the Temple for World Peace at Manjushri KMC was special. We enjoyed an informal evening with Gen-la Dekyong, Spiritual Director of NKT-IKBU, to celebrate the work of the International Temples Project. 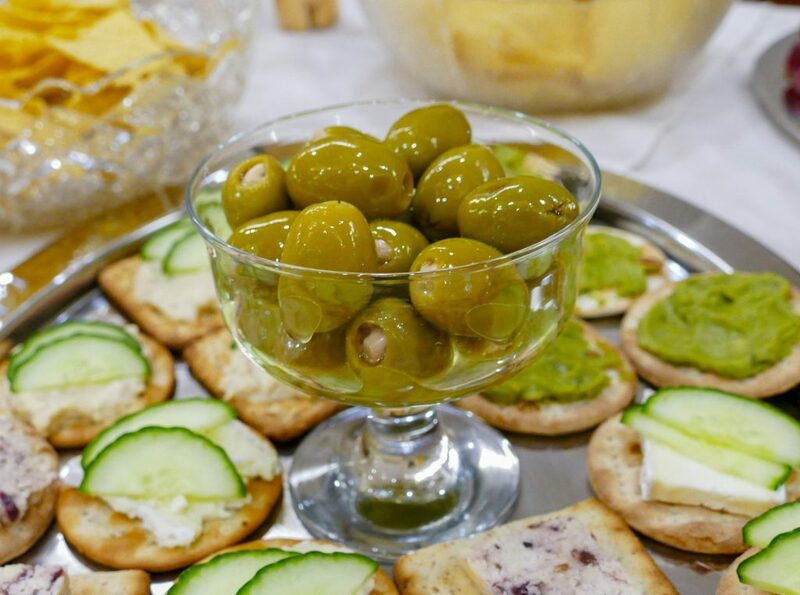 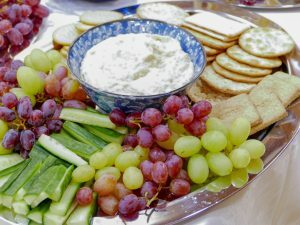 On the menu was some extraordinary and practical advice from Gen-la, inspiring videos and a delicious buffet to finish with. 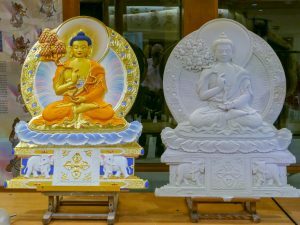 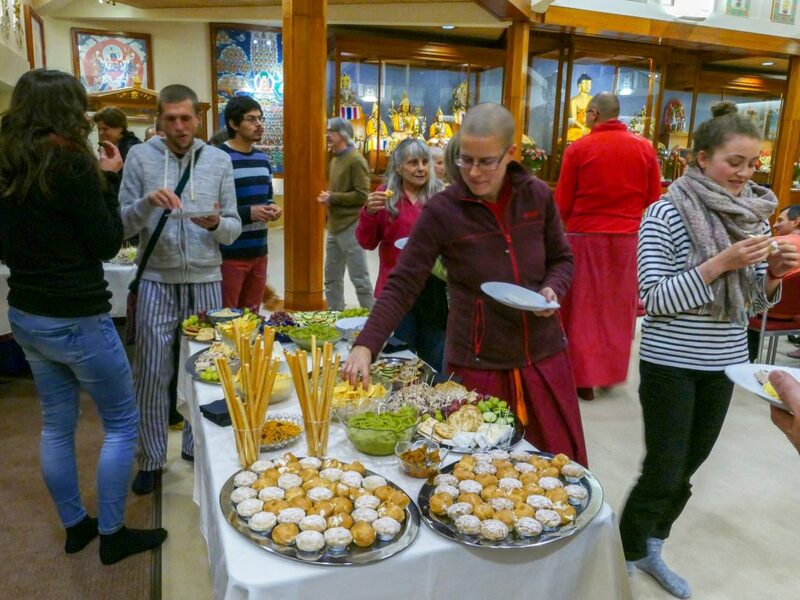 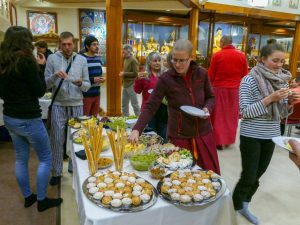 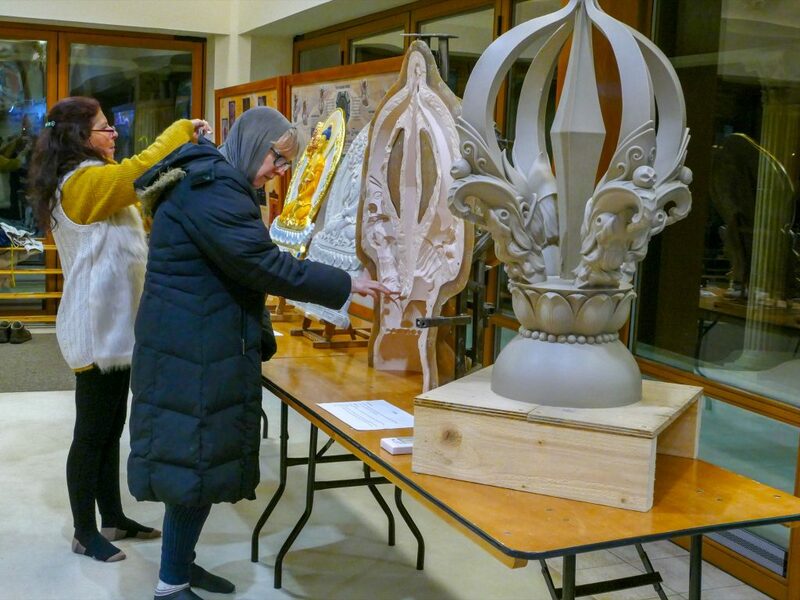 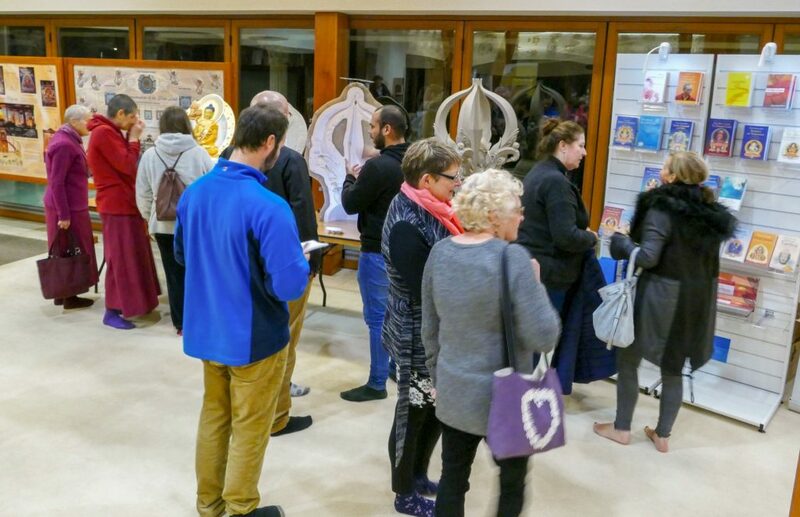 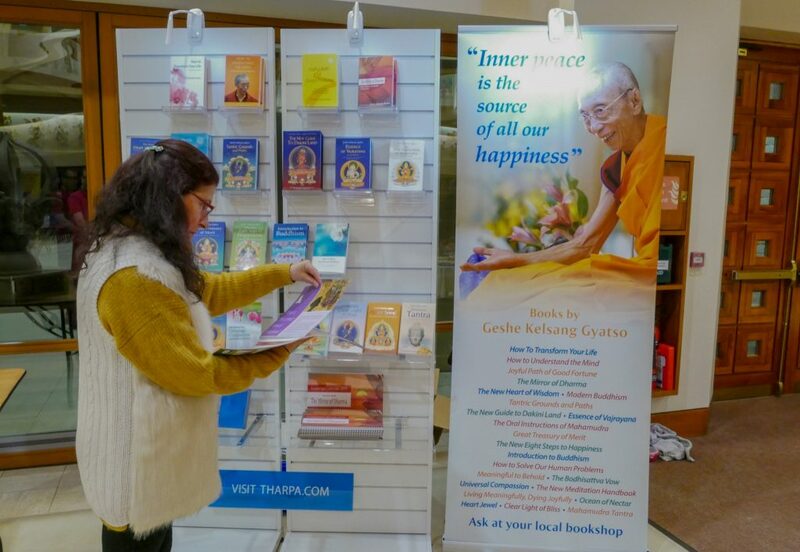 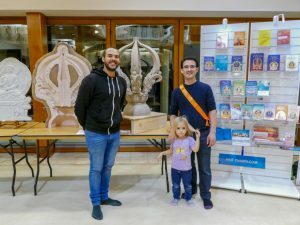 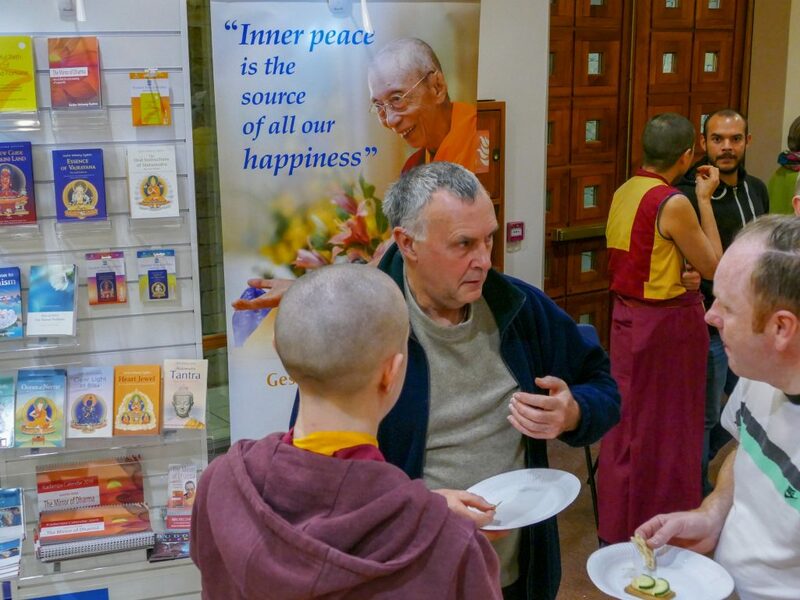 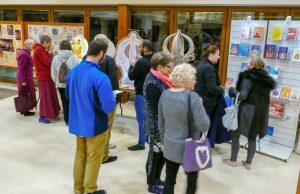 Some of the work of the Kadampa Art Studio and Tharpa Publications was also on display in the Temple to illustrate the connection between the work done at the center and the benefit received by people all over the world. 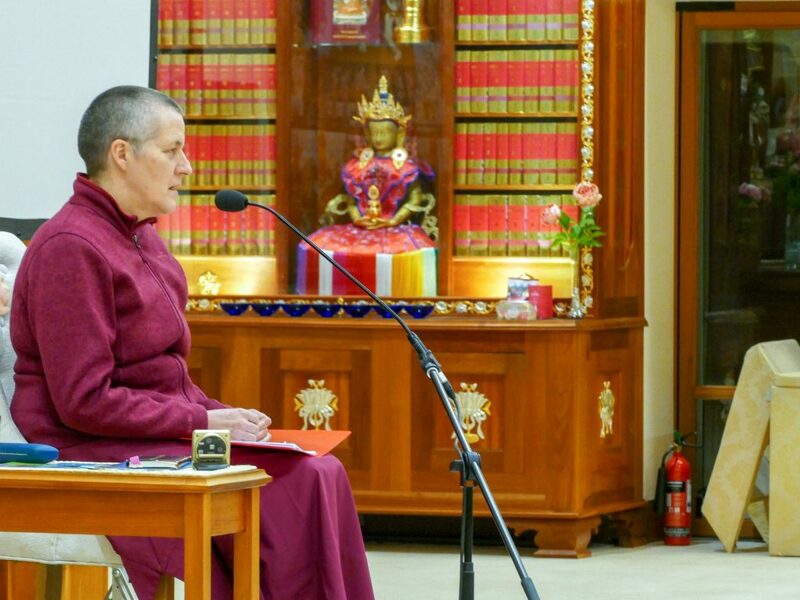 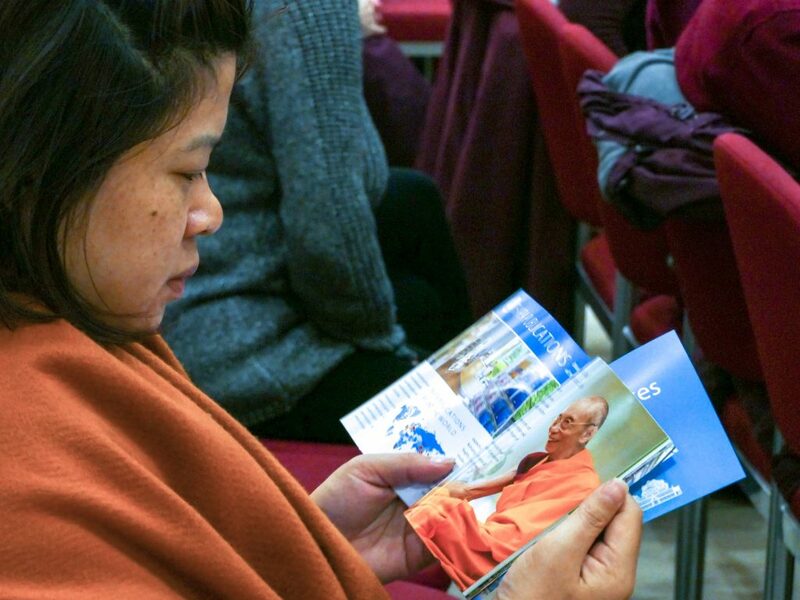 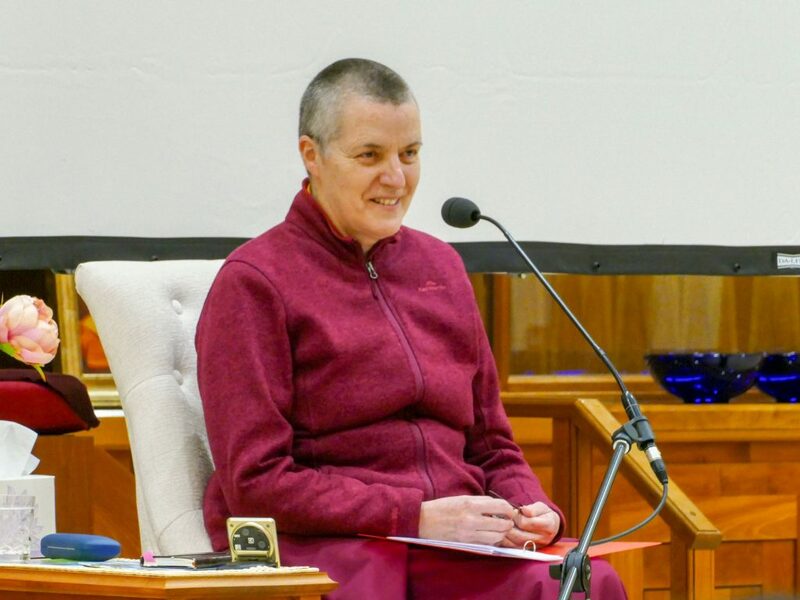 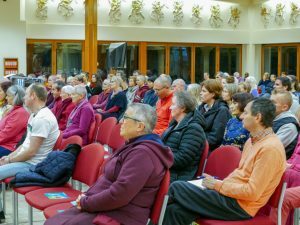 During her talk, Gen-la encouraged us to appreciate the precious opportunity we have being alive at such a powerful time, when through the extraordinary vision and energy of Venerable Geshe Kelsang Gyatso Rinpoche the physical conditions for Kadam Dharma to flourish throughout the world are appearing daily. Venerable Geshe-la says that his students particularly appreciate the importance of the third sphere, Dharma work, at this time and follow his example of dedicating time to these meaningful activities. 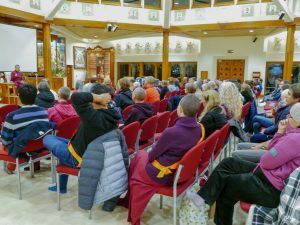 Gen-la explained how it is important for us to see the connection between the work we do at or for our local center and wider events and the realization of Venerable Geshe-la’s compassionate vision to create a Kadampa Temple for World Peace in every city in the world. 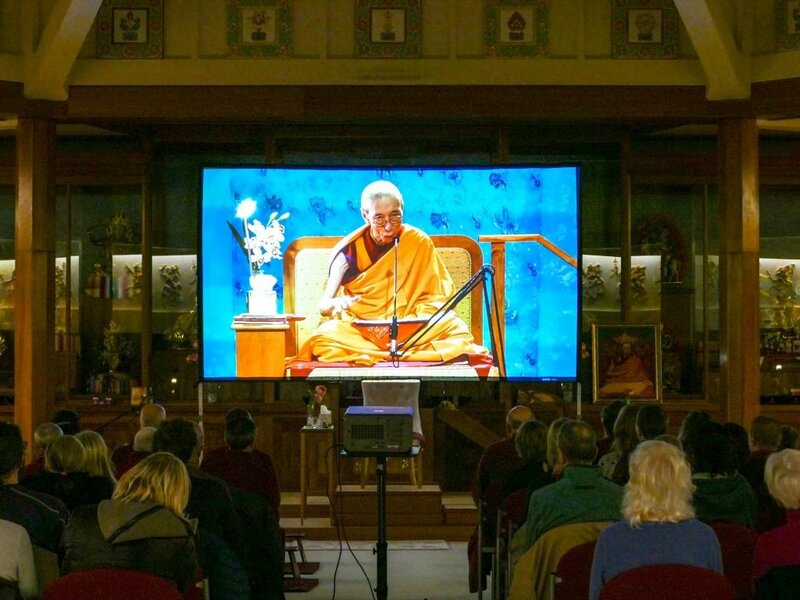 However small our contribution to the work of the center might be, we should always remember that directly or indirectly we are helping this vision to come true. We should appreciate our good fortune at having the opportunity to make such voluntary work part of our spiritual life. 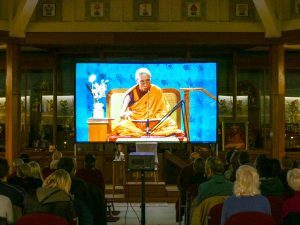 It is a Bodhisattva action of giving Dharma to this and future generations. 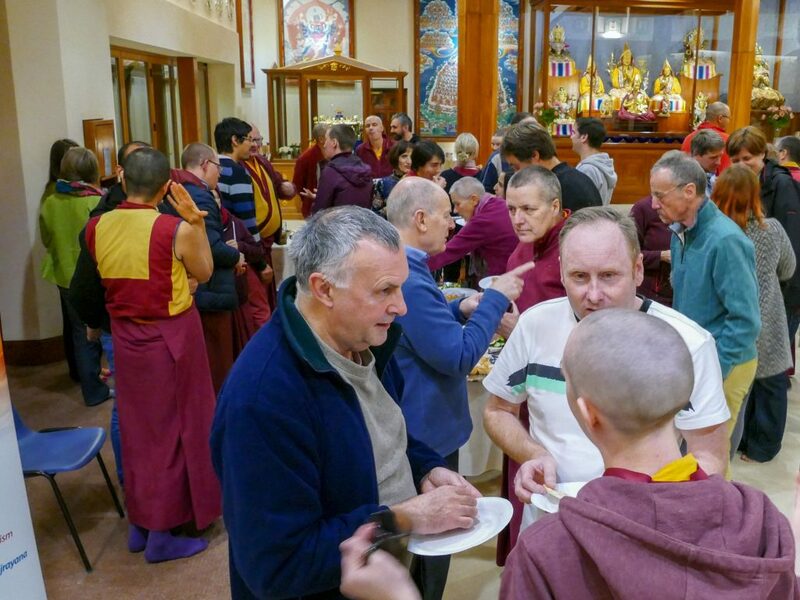 Manjushri KMC has launched a project called ‘One day makes a difference’ to give local people and visitors the opportunity to volunteer to help with these auspicious projects, and it was very heartening during the evening to see people signing up to make a contribution.